In this first part of multi-blog series about SAP S/4 Embedded Analytics, we cover Architecture and core components of SAP S/4 HANA Embedded Analytics. We bring examples of Core Data Services (referred as CDS) in our next blog https://blogs.sap.com/2017/07/05/jump-start-to-abap-core-data-services/. Embedded Analytics is an integral component of SAP S/4 HANA. S/4 HANA is available both On-Premise and cloud editions with respective independent release cycles. SAP HANA was released to customers as In-memory platform in year 2011. Over the last 6 years, several SAP solutions have been powered by SAP HANA as shown in Figure 1. SAP S/4 HANA is SAP’s next generation Business Suite which provides instant insights on Live data without data redundancy or any latencies. It supports in-context information with analytics and insights. No ETL or Batch Processing is required as compared to traditional landscapes involving ERP and BW system. SAP S/4 HANA supports key decision management aspects such as Strategic [historical data], Operational [recent business data] and Tactical Decisions [current data cast against contextual data from past]. Traditionally separate systems were used to meet the needs of transactional and analytical requirements. SAP S/4 HANA offers an integrated transactional and analytical data platform to process complex analytic queries as a harmonious data collection as shown in Figure 2. On the same Technical Stack — Improved Total cost of ownership(TCO). SAP S/4 HANA Embedded Analytics is Concept, Content and Toolset to enable Embedded (built-in) Analytics, Real-time Operational Reporting, and Smart Business Cockpits etc. It uses the technology of SAP ABAP Core Data Services( referred as CDS) to create Virtual Data Models (Representation of operational data). Additionally, provide forward looking tools that offer user friendly access such as SAP Fiori for Embedded Business Intelligence, Reporting Client, Query Builder, Query Browser, SAP Lumira and SAP Business Objects Enterprise/Cloud for Strategic Business Intelligence as shown in Figure 3. SAP S/4 HANA Embedded Analytics serves and enables all the user roles as shown in Figure 4. In this section, we cover core components Virtual Data Model (VDM) and Core Data Services (CDS). Operating Data is represented in S/4 HANA using Virtual Data Models. S/4 HANA shields the existing primary ERP persistence/tables by an understandable, comprehensive Virtual Data Models. With the availability of the SAP HANA platform there has been a paradigm shift in the way business applications are developed at SAP. We start with database table which act as primary persistence in SAP Business Suite as shown in Figure 5. In SAP S/4 HANA front end is decoupled from backend by Web protocols. SAP S/4 HANA exposes the backend data and functions as OData services which are consumed. Core Data Services are SAP’s strategic modeling approach for Business Entities. VDM shields the existing primary ERP persistence/tables by a layer of SQL views which are defined in ABAP application layer as Core Data Service view as shown in Figure 6. CDS offers a SQL based layer that extends the SQL-92 standard. CDS holds all metadata information and supports new hybrid scenarios for embedded analytics by, for example, using existing authorizations and hierarchies of SAP S/4 HANA. Extends SQL to capture business intent in the data model. Reduces technical complexity in the query. These views are private in nature and not exposed (hidden) for end user consumption. They are introduced to facilitate the transformation of the underlying data model towards the public view model. Private views are typically used to overcome limitations in the CDS modeling (e.g., missing sub selects, missing associations in union views). Technical names of private CDS views start with P_. There are private views for both interface and consumption views. It is not recommended to change or extend the private views. Basic interface views represent core entities without data redundancy—that is, with a single representation of each core entity (e.g., exactly one customer or sales order) and only with those fields that are dependent on the core entity itself and cannot be calculated from other fields. Basic views form the low-redundancy model and simple projection on top of the SAP Business Suite database tables/persistence. Composite Interface views are derived from multiple basic interface views and may offer associations, aggregations, and complex calculations. They can be specific to a consumption domain or reusable by many and always expose redundant data by design. Depending on the use case, there may be multiple layers of composite interface views. These views are exposed for end user consumption and created using one or more interface views. These are public domain–specific views for analytics, search, and transactional applications. 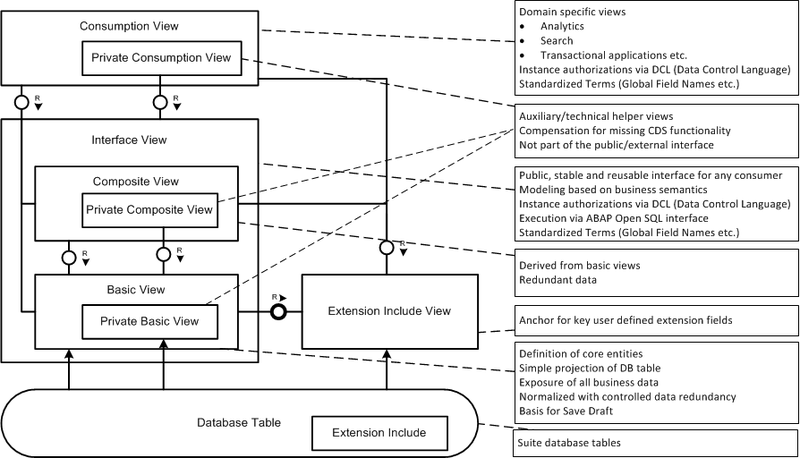 The guiding principle of the VDM model is that database tables must not be accessed directly by consumer views of the VDM (bypassing the interface layer). Technical names of private CDS views start with C_. Extension include views are used to expose custom new fields created as part of customer project implementations. SAP-delivered extension include views can be extended to add additional fields. The customer extension include view is created and transported as a separate DDL source. Technical names of private CDS views start with E_. 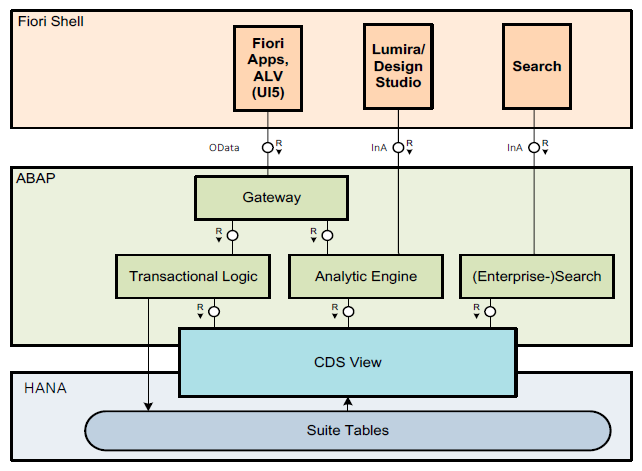 Figure 7 shows all the layers involved in CDS Views. Can historical data reporting be done using embedded analytics? Do we need to consider anything from sizing perspective while implementing embedded analytics? From the sizing perspective, after the finalization of scope (no. of reports/users/drill downs, high work load hour etc), it further needs to be verified on the sufficiency of the current hardware as CPU utilization is impacted with no of users involved for reporting purpose. Can we use legacy data for embedded analytics? Is this recommended? SAP doesn’t recommend consolidation of data from third systems for embedded analytics and it is meant for operational reporting only. Embedded analytics is not intended for building an Enterprise Data Warehouse. Sure we also try to cover APF. It’s a nice summary – I’ve added it to our SAP Fiori for S/4HANA wiki as an overview of the important parts of analytics. Good One. Thanks for this excellent summary! thanks for the summary. I have one question: the S/4 VDM is created via ABAP CDS. What is the reason for not using “HANA CDS” for the embedded analytics that are supposed to be used with HANA and should have much better performance? Important difference between ABAP and HANA CDS is platform independence. Unlike the SAP HANA-specific variant HANA CDS, the ABAP CDS are independent of the database system. Nice blog. Could you please add a link for the other parts (i.e. 2 &3) of the blog in here, and also in the other parts. I was able to reverse navigate, but there is no way to navigate in forward direction.